He created the finest comedy character in modern cinema. 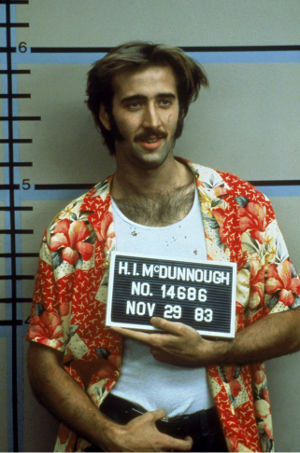 'Raising Arizona' is a cult classic for many excellent reasons. None more so than Cage's remarkable interpretation of leading role H.I. McDunnough. The actor honed a staggering combination of electric energy, deadpan delivery, physical dexterity and meticulous character definition. The Coen Brothers' second film is heralded by many as their finest ever comic work. The duo know that Cage defined the masterpiece; true genius was on display. "The doc went on to explain that this woman, who looked as fertile as the Tennessee Valley, could bear no young. Her insides were a rocky place where my seed could find no purchase." How could we not love this man? He turned seedy into beauty. Who else but Cage could take a twisted tale, spun on fatal alcohol abuse, prostitution, violence and death, and turn it into a thing of beauty? Cage achieved this remarkable feat in 'Leaving Las Vegas'; making the twisted lead character not only seem human, but curiously likeable. His delicate portrayal of a dangerously flawed character was like watching a master walk a tightrope. Instead of the audience being thrilled by the sensationalism of 'controversial subject matter', they were lulled solely into the captivating narrative of one individual and their final steps. Only Cage could have taken us on that path. The Oscar panel wholeheartedly agreed, awarding him 'Best Actor' for his portrayal of Ben Sanderson. Many actors can bowl us over with a stunning performance, only Cage can share remarkable 'two for one' generosity. In a staggering display, Cage played identical twins in the critically acclaimed 'Adaptation'. These were identical twins with two very different personalities. The landmark work earned the actor international recognition, with BAFTA, Academy Award and Golden Globe nominations amongst the select acclaim. The true test of our finest actors is their range and dexterity. In a career defined by contrasting roles, Cage's portrayal of Charlie and David Kaufman demonstrated in one clean swoop why he stands head and shoulders above his peers. An action hero with an invisible mullet. Playing an action hero may not be regarded as the greatest test for an actor. However, creating a believable one whilst simultaneously sporting the world's worst haircut? This was a test only Cage could master. 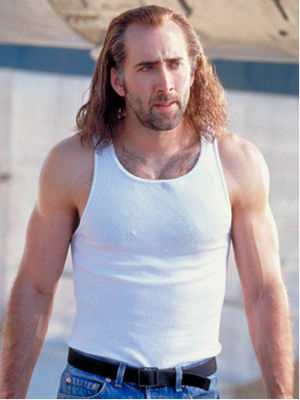 'Con Air' was a huge box office success and the lead man Cameron Poe (Cage), was the electric central character. Using all his skill and expertise, Cage somehow tricked the audience into forgetting that he had the ultimate anti-hero prop atop his head, the dreaded mullet haircut. Instead, we were carried along by an energised performance, effortlessly sucked into Poe's dashing bid to save the day. Not since Hulk Hogan became a wrestling champion hero (more than twenty five years ago) has a haircut handicap been so deftly overcome. Nicolas Cage, we salute you. Trouble comes knocking on all of our doors at some point. When that moment arrives, it is reassuring to think that Nicolas Cage might be there to protect us. 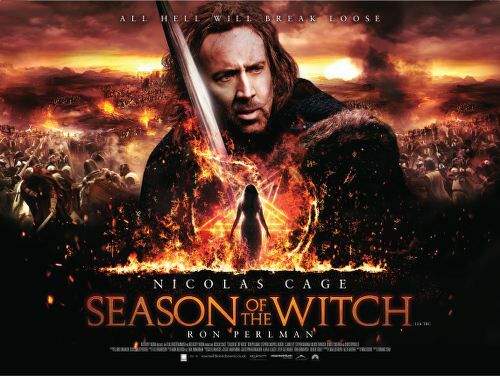 His latest role, as the swashbuckling Behman in 'Season of the the Witch', reminds us that, despite his haircut, Cage will always fight to the death to uphold our honour and keep us safe. In his latest performance, Cage's Behman has a very big sword, cutting his way through all manner of nasty villains in a manner that makes us weak at the knees. Only Cage could command such a performance; displaying manly vigour, yet somehow letting grace and humility seep through the character. Nicolas kind sir, there can be only one conclusion. We love you.